Stafford might have only been James Civali’s second start in a NASCAR Whelen Modified Tour machine, but you would not know that by watching him. Civali ran with the leaders all day and finished eighth. “It was a decent run. We were still a little loose in and if it wasn’t loose in, we would have been better. It was hard to pass. Every time that I would get into the corner, the front tire would lock up because we had to adjust the front brakes since it was so loose in. As hard as it is to believe, Civali’s finish could have nearly been just a little bit better. Still, not everyone was thrilled with Civali after the race. 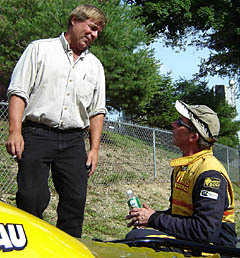 He went wheel to wheel with Eric Beers late in the going and the two drivers pulled alongside each other after the race. NASCAR was observing the incident just in case it got out of hand. But with Beers being one of the mildest mannered guys in the sport and Civali keeping his cool, they had nothing to worry about. Maybe “problem” isn’t the right word to describe things, but Beers wasn’t thrilled with how Civali was racing either. That ended a good run by the team. Finishing second was nice, but Hossfeld’s holiday weekend would have been much better with a win. Hossfeld now sits second in points to Ted Christopher, but he realizes that counting markers right now is, well, pointless. “It’s real early, anything can happen and that’s a lot of racing left,” said Hossfeld. The Haynes 150 almost belonged to Doug Coby. The young driver has won races at Stafford Motor Speedway in Late Models, Pro Stocks and SK Modifieds and for well over 100 laps in Sunday’s race, a NASCAR Modified Tour victory looked to be within his reach as well. With a handful a laps left, Coby couldn’t hold off Ted Christopher and Chuck Hossfeld. The nearly straightaway lead that he had was gone after a few late race cautions and his tires were the same ones that he started the race on. Coby ended up third in the #77 Chase car, but wasn’t down at all about that. Coby also knows that he’s not alone when it comes to wins that have gotten away. The #77 looked so quick that it seemed that Coby’s job was almost easy. It was. Hossfeld had engine problems during practice and that made for a busy afternoon. For the second straight race, Tony Hirschman found himself in the wrong places at the wrong times. At Waterford, he got spun on the last lap. 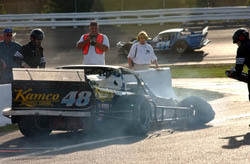 This week at Stafford, he got spun, beaten, banged and more all through the race. At that point the #48 team was down, but not out. That didn’t last though. Hirschman ended up dropping out of the race one lap after the halfway mark on lap 76. He was credited with the 24th finishing position. Despite the finish, Hirschman is still in the top five of the Modfiied Tour point standings. Finishing second in the Haynes 150 and putting on a great battle in the final 10 laps of the race was impressive enough, but when you realize what Chuck Hossfeld and the #50 Don Barker team did to get to that point in the day, it is even more impressive. Pasteryak returned to the seat of his #5 car after letting his son Chris use it to make his NASCAR Modified Toru debut last week at Waterford. It’s all part of a gradual changing of the guard from one generation to another in the ride. Charlie Pasteryak had a good day at Stafford. He ran in the lead pack all afternoon and brought his #5 car home in the sixth position. Last week, Donny Lia won the Tour race at Waterford Speedbowl (CT) and made it look effortless by leading all 150 laps of the event. This week at Stafford, Lia finished 10th in the rain-delayed Haynes 150, but Lia and his team worked at least twice as hard for that result. Lia got caught in an early crash during the wreck-plagued event and played catch-up from there. He struggled with handling problems after winning the pole position for the race, but came back from a lap down to finish 10th. 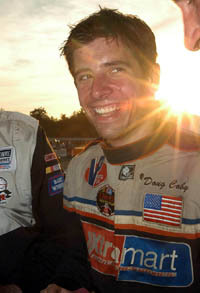 Lia maintains third place in the Modified Tour point standings as a result of his finish. It looked like Jerry Marquis bad luck might have gone on vacation after he finished fourth at Waterford last week, but it reared its ugly head again at Stafford. Marquis got caught in all of the carnage of the race and finished 26th after dropping out of lap 55. “The only thing that I’m doing right now is looking forward to Jennerstown and trying to get out of that alive. We’ve got a good car and a good set-up for Loudon. The way our luck is going, something has got to change. We just keep being at the wrong place at the wrong time this year so far. These guys are busting their butts and we have a good car everywhere. We had a good car today and it was great until we got taken out. It’s one of those racing things that you can’t avoid. You just have to be in the right place at the right time. 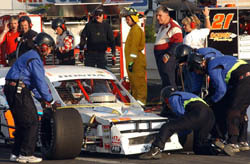 Eric Beers led the first 25 laps and seemed to be primed to be a threat for the victory at Stafford. He ended up seventh, which was a good day, but not the great one he had hoped for. Part of the reason for that was a strange set of circumstances as far as tires went. Now Marquis sits 10th in points after being pegged as a championship contender in the pre-season. His Mystic Missile team has run well everywhere this year, but keeps being in the wrong places at the wrong times. Marquis is hoping to change that. 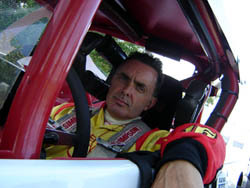 Mike Stefanik stayed out of trouble to stay in the top 10 with the #00 Brady Bunch car up until there were a handful of laps left at Stafford. That is when Stefanik simply pulled it behind the wall and retired.